RECESSION AND STAGFLATION- How do we respond? You can’t open a financial newspaper or watch a financial program without hearing the latest buzz-words recession and stagflation. There has been much banter lately as to whether or not we are in a recession, approaching one or simply in an economic slowdown. I just love it when the experts can’t agree with each other because it re-enforces my precept of making your own decisions based on self-education. Recession: A significant decline in activity spread across the economy, lasting more than a few months. It effects industrial production, employment, real income, and wholesale-retail trade. The technical definition is two or more consecutive quarters of negative economic growth as measured by the country’s Gross Domestic Product or GDP. This is the definition I learned when I took Economics in college. So are we in a recession? Many experts say that we are. Warren Buffett, the greatest investor of our time, recently stated that common sense told him that we are in a recession. On the other hand, Steve Forbes, the President and CEO of Forbes and Editor-in-Chief of Forbes Magazine disagreed. Steve Liesman, the Senior Economics Advisor for CNBC is on the side of no recession but getting close. If we abide by the technical definition of two consecutive quarters of negative GDP then we are not in a recession because we have yet to have one such quarter. The 4th quarter of 2007 was a plus .1% and the entire 2007 year was a plus 2.2%. Economic slowdown? Absolutely. Recession? Depends who you ask. When it comes to listening to the experts, I listen to them all collectively, but to none of them individually. You’ll note that I have the same approach when it comes to stock selection. Stagflation: This is a macroeconomics term used to describe a period of inflation combined with slow economic growth and rising unemployment, possibly including recesssion. It occurs when the economy isn’t growing but prices are. This happened in the 1970s when the world oil prices rose incrementally, fueling sharp inflation in developed countries. We can understand why the concept of stagflation has been brought up recently given the $100/barrel of oil prices. But inflation is still a concern but not yet a problem (except at the gas pump and certain food items). So once again, are we in a recession or suffering through stagflation? Depends on who you ask. Federal reserve Response: The Fed has responded to the economic slowdown by lowering the target Federal Funds Rate. Most experts agree that the rate will be cut even more later this month by 50-75 basis points. Stock Market and Recessions: Since 1948, the ten recessions were preceeded by a stock market decline by an average of 5.7 months. However, the 10 stock market declines of more than 10% were not followed by a recession. Real Estate Markets also decline before a recession but can last much longer than the recession itself. In the past, most stock market experts recommended high-yielding stocks during a period of contraction. This would include financials, pharmaceuticals, and tobacco. It is obvious that because of the sub-prime catastrophe that the financial wizzards perpertrated upon us, financials would not apply in this case. What our government is saying: On Friday March 7, President Bush said that “It’s clear our econmomy has slowed” but reassured the public that the outlook is good. The President’s top economic advisor, Edward Lazear, said that the current quarter could drop into negative territory. This point was brought home by the fact that the economy lost 63,000 jobs last month, the most in 5 years. “I’m still not saying that there’s a recession,” Lazear said. “We are going to have a weak growth quarter, and whether you call it a recession or not is something that we won’t know for many months. The White House predicts job numbers to pick up by Spring and growth will rebound by the summer, driven primarily by the stimulous package. Conclusion: Nobody can dispute the fact that we are in an economic slowdown. We are not certain if we are in or entering a recession or period of stagflation. When making our investment decisions, we must decide how to handle our investments based on this information. The stock market has declined 10% since the beginning of the year. Real Estate has been depressed for the past 18 months and experts can’t agree as to when to expect a bottom. Treasuries, bonds, money markets and CDs are returning profits that would cure even the worst case of insomnia. On the other hand, even in a depressed stock market, there are sectors and industries that are performing well. One such example would be the commodities. A commodity is a basic good used in commerce that is interchangeable with other commodities of the same type. For example a barrel of oil is a barrel of oil whereas electronics can differ based on who is producing it. I will give examples of outstanding performing stock market commodiites when I do my Industry Analysis later in this article. 1- Sell to Open: You are opening an option position by selling (in our case) a call option against a stock we already own. This position will remain open until such time that it expires or we buy it back to institute an exit strategy. 2- Buy to Close: Buying back an option previously sold thereby closing the position. At this point, we simply own the underlying equities without obligation. It’s as if we never sold the option originally although the cash generated by the original sale is still ours to keep. This is a new addition to my column. I depend on you for your generosity in sharing your investment ideas with the rest of us. Here are the stocks in our current portfolio and how much they have gained/lost since we bought them in mid-February. BUCY has gained a whopping 12% while FLIR has lost a depressing 19% so far this month. But here’s the cool part- we are still on track to make a 3.8% return this month so far, even with the terrible last week of the market! That is because we sold a basket of calls that were mostly in-the-money. As a result we are making money on all of our stocks(including INFA) except for FLIR. If we were buy and hold investors with the same stocks we would still be up but only 1.4%. That’s the difference between a 45% annual return and a 17% annual return! My thanks to Linda and David for sharing their ideas. 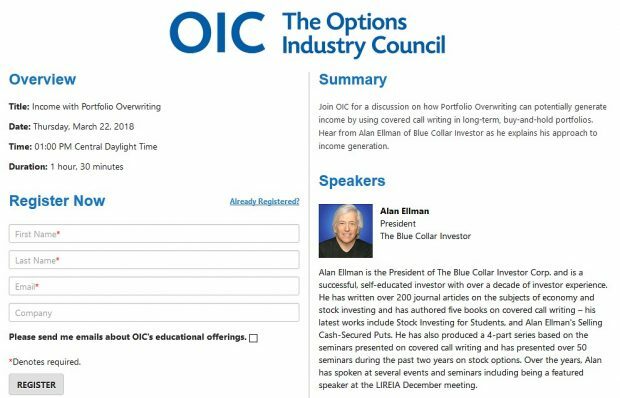 It is obvious from their selections how sophisticated and knowledgeable a Blue Collar Investor can be. Please send me your favorite stock picks and I’ll include them in my next article. I own MOS @ $95 and previously sold the March $95 call (made 5% on that one). If I buy the option back today, it would cost me $1450 per contract. I would then turn around and immediately sell the April $95 and generate $1800 per contract for a profit of $350. Since my cost basis is $9500, my 1-month return is 3.7% or 44% annualized. Even better, my profit is protected even if the stock value depreciates to $95 from its current $109.21. That’s 15% downside protection over and above the 3.7% profit from the sale of the option. These are real #s folks. Keep your eyes and ears open for deep-in-the-money exit strategies usually around expiration Friday.